I get it. Very poignant. The drawing and commentary reflect your serious side as well. I love that. It reminds me of Katharine White, planting things she knew she would not live to see, and writing about it to Elizabeth Lawrence. Hi Joseph, Found your blog via a link on Annie's Annuals. I love this cartoon. So much about gardening is about the entire process, not just the results. From seed to compost it all makes me smile. Glad I found ya here. Look forward to poking around a bit when I have more time. I read that a couple of months ago and have thought about it a time or two since. Enjoyed reading the other comments too. Thank you so much for the comments everyone. I'm glad this idea struck a chord with you as well. Lovely drawing and sentiment, Joseph. Thank you. I remember being knocked over by the old B/W 1939 movie "Dark Victory". It was on TV back when I was a young gardener. 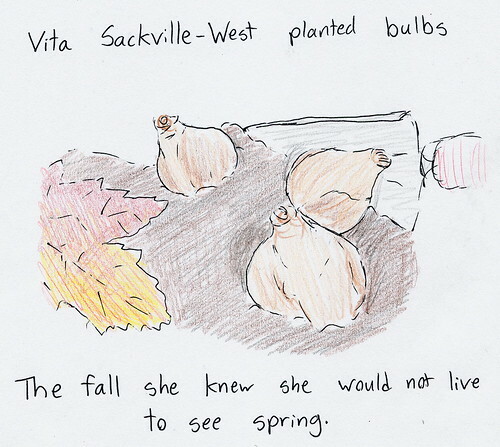 In that story it's Bette Davis planting bulbs that she will never see in bloom. beautiful. I just found your blog through a facebook friend.